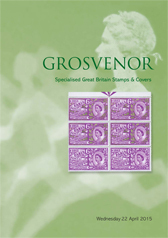 A specialised auction of over 1,200 lots, the property of 125 vendors, featuring an award-winning collection of Liverpool Postal History; the collection of Great Britain formed by the late Dennis Clarke; very fine line engraved and Seahorses; an excellent section of QEII commemorative errors including many great rarities; and one of the finest and most comprehensive collections of 1966 ‘Birds’ ever assembled. Private viewing will be available from the 31st March. Please telephone us beforehand to arrange an appointment. Please note viewing will not be available on the 21st April.